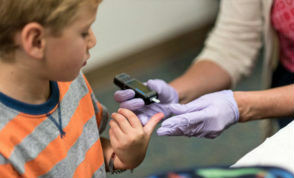 Just think, if your child has this disease DIABETES? Diabetes is a disease which gradually makes the body hollow. Diabetes is considered to be a dangerous disease not only for physical but also for mental health.The biggest problem with the children is that their problem could not be understood quickly. Children can not understand their problems properly. In such cases, sometimes the disease keeps prolonged in them. The problem increases due to lack of long-term treatment. Frequent Urination - This is the most common symptom of diabetes, which is also found in older people. When the child's thirst will increase and he will take more liquid, obviously, he will have to go to urinate again and again but if your child is showing such symptoms from long time then be smart, these symptoms can also be the beginning of diabetes. Thirsty - When the sugar levels rise abnormally in children, they feel very thirsty, they also want to consume too much of liquid things like juice and colrrink. If your child's thirst has increased a lot suddenly, do not forget to show him to the doctor. Feeling Tired - Children suffering from diabetes are not active like other normal children. Due to the decrease in the amount of insulin, there is a lack of energy in children. They are tired of being weary and lethargic compared to other children. Blurry Vision - If your kid suddenly facing any problem in vision like blurred vision,less ability to see consult with doctor,it may cause diabetes. Children grow up, their physical needs also grow, like eating more, drinking etc. Not necessarily thirsting, excessive urination means diabetes, but if these symtoms stay longer, then pay a little attention and get to the doctor.If you recognize these symptoms in your child at the beginning, then your child may be free from this problem quickly. Special care and refrain is needed in diabetes.